Don't struggle with buttons or zippers any longer. The PocketDresser™ is a revolutionary aid that makes dressing an easy task for persons struggling with arthritis or some other hand impairment. Constructed of fully hardened 301 stainless steel with aircraft aluminum handles and a comfortable nylon strap, this dressing aid is the best available. Superior design, industrial quality, lightweight and reliable. This dressing tool has a large button hook that is sturdy enough to handle buttons on jeans, pants and coats; the small button hook and closed loop buttoner easily fastens shirt and cuff buttons. The zipper pick zips pants, sweatshirts and coats with little effort. All tools fit into neatly into the handle for easy storage and transport. 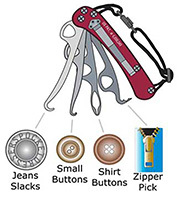 Large triangular loops on each tool make them easy to open for use. This handy dressing aid is dishwasher safe and comes with a one year manufacturer's warranty. Give yourself or your loved one independence with dressing again. Handle available in red.